I worry too many people are wasting their energy protesting the U.S. Secretary of Education and not spending enough time putting pressure on the state Legislature and their local school boards to fix Washington’s inequitable school system. The divisions in American political life were so clear on Friday night in Bellevue. About a thousand protesters gathered on a street corner near Bellevue Square, chanting and holding hand-lettered signs objecting to the policies of the U.S. education secretary. Inside the Hyatt, Betsy DeVos, who probably never heard or saw those protesters, encouraged about 1,500 people to keep pushing Washington state to follow her vision for education, beyond charter schools toward vouchers. The applause for her speech was warm but not wildly enthusiastic. After talking to some protesters and some Washington Policy Center dinner guests, it’s obvious that both groups want the best for Washington kids. But neither is doing enough to make that vision happen. DeVos said one thing closely related to that point: The states are best equipped to fix their own education issues and don’t need the federal government to tell them what to do or interfere with their policies. Protesting can be cathartic, a good way to gather like-minded individuals together and may even bring some attention to just causes, like the women’s marches after the election. But if the protesters and the dinner guests want to make sure children from poor families are graduating from high school ready for college or career training, there are more effective ways to push for change. Two women — one inside the Hyatt and one outside — offer two possible approaches. Ami Lara is the mother of a student at Destiny Middle School, a charter school in Tacoma. She is a Democrat, the daughter of a teacher, a member of the Center for Latino Leadership, a strong advocate for school choice and introduced DeVos before her speech. Probably best know for her relentless pursuit of legislative action to keep charter schools legal in Washington state, Lara visited every lawmaker in Olympia to plead her case and arranged dozens of legislative visits to her daughter’s school. “I don’t think politics should have a seat when it comes to education,” said Lara, who arrived at the event early and didn’t see the protesters. 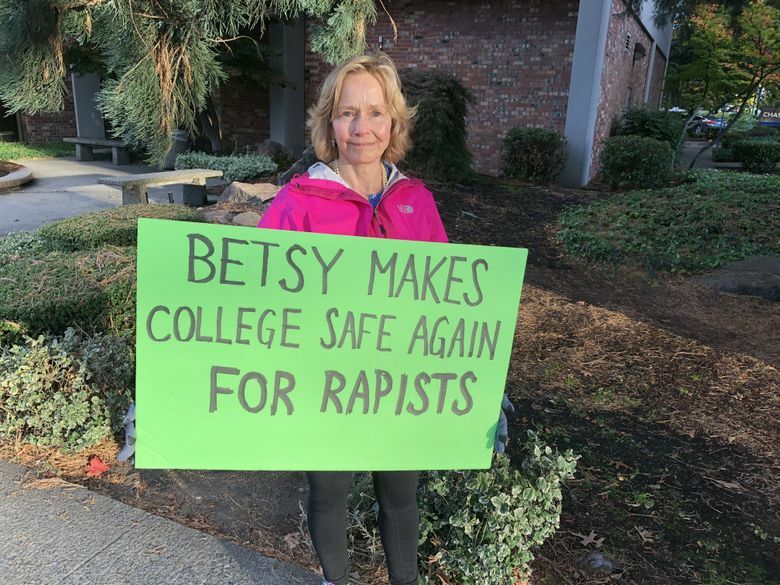 Paula Harper-Christensen, a semiretired teacher and grandmother from Sammamish, waved a sign at cars heading into the parking lot to hear DeVos speak. She is well versed in education-policy issues, and says her master’s degree and teaching experience make her more qualified to be education secretary than DeVos, a wealthy businesswoman and school-choice activist. Harper-Christensen does more than participate in protests. She regularly calls and writes her congressmen to share her views on a variety of issues. She has never called or written to DeVos but thanked me for that suggestion. She thinks DeVos wants to privatize public education and is gravely concerned about her perspective on LGBTQ issues and changes to federal policy on campus sexual-assault investigations. “I just want education opportunity to be for all students,” said Harper-Christiansen, who home-schooled her own children and isn’t opposed to every kind of school choice. Both Lara’s and Harper-Christensen’s enthusiasm for political action are commendable. Others in both crowds are also trying to make a difference. But I worry too many people are wasting their energy protesting DeVos and not spending enough time putting pressure on the state Legislature and their local school boards to fix Washington’s inequitable school system. Imagine the impact if all those 2,500 people showed up at a school-board meeting or stood outside a legislative-committee meeting to advocate for spending more money to help struggling students and their schools. They could hold signs asking for a longer school day, more reading tutors, a longer school year, Saturday catch-up sessions and more access to quality early learning. All these ideas cost money, but they would help the children who are least likely to graduate from high school and go on to college or career training. School officials have a pretty good idea of the intense work required to turn struggling schools around, and they are trying some things within current budget restraints. Why aren’t they accomplishing more? Maybe because we aren’t getting our message to the right people. We’re all still spending too much time on Facebook complaining about the president and not enough time marching in Olympia, trying to change the things we might have a chance of actually changing.